Parking at CIRA is a breeze, and with free parking every spot is the best deal in the lot! 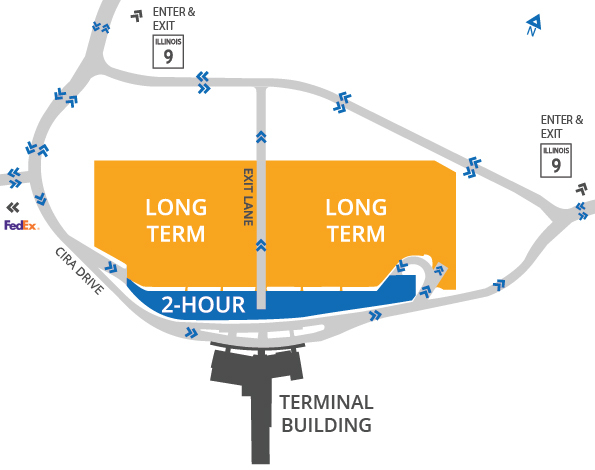 Short term is defined as two hours or less and is immediately in front of the terminal building. Long term (anything over two hours) is immediately behind the short term parking lot. You may park your vehicle for free for the entire length of your trip as long as you are using one of our airline or car rental services. Signs will guide you toward either short term or long term parking as you approach the terminal from the entrance road. A complimentary parking shuttle is available to take you from the parking lot to the terminal and back again upon your return. Ride the shuttle from the parking lot to the terminal, and when you return, the shuttle will pick you up at the front curb to take you back to your vehicle. You can also call for the shuttle using the designated phone in the bag claim area or by calling (866) 967-2472. The CIRA parking lot shuttle is equipped with a wheelchair lift for accessible access for all riders. Saturdays – 4:00 a.m. to 10:00 a.m. & 2:00 p.m. to 5:00 p.m.